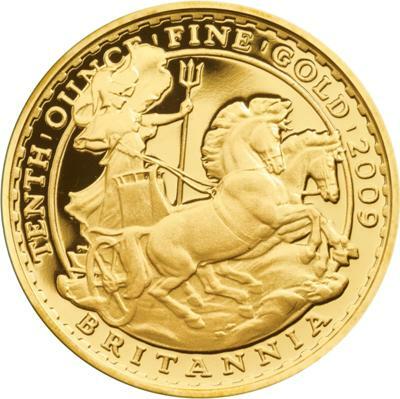 The Royal Mint is delighted to introduce the 2009 Britannia collection, featuring Philip Nathan’s famous 1997 design of Britannia standing tall in her chariot. His stunning design appears on the reverse, while the current portrait of Her Majesty the Queen takes pride of place on the obverse – the first time that the two designs have appeared alongside each other on a gold coin. Britannia has seen a wide range of interpretations and this offering from Philip Nathan draws its inspiration from Boudicca, the famous warrior queen who led the heroic and daring revolt against the Romans. “Bringing together Philip Nathan’s powerful design with the current portrait of the Queen for the first time on the gold Britannia family makes these coins especially desirable. - The four-coin set: £100, £50, £25 and £10 gold Proof coin, with a product issue limit of 1,250 and priced at £2,050. The set comes beautifully presented in a luxury walnut-veneer display case and is accompanied by a numbered Certificate of Authenticity. Purchasing this set is the only way to own the £100 and £50 2009 Britannia gold Proof coins. lowest ever issue limit since its introduction in 1987. The £25 version has a product issue limit of 1,000. Both are accompanied by a numbered Certificate of Authenticity. 1. The Royal Mint has a history dating back over 1000 years. By the late thirteenth century the organisation was based in the Tower of London, and remained there for over 500 years. By 1812, the Royal Mint had moved out of the Tower to premises on London’s Tower Hill. In 1967 the building of a new Royal Mint began on its current site in Llantrisant, South Wales. 2. There were estimated to be 28.2 billion United Kingdom coins in circulation at 31 March 2009, with a total face value of £3.6 billion – all manufactured by the Royal Mint. 3. 1.3 billion United Kingdom coins were issued during 2008-09. 4. Of the higher denomination coins, it is the 20p piece that is most in demand – with more than 2.4 billion now in circulation. This is a great addition to the website!